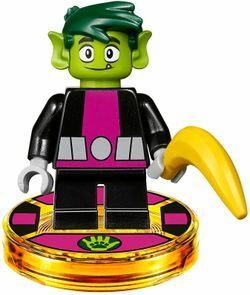 Beast Boy is a DC Comics Super Heroes minifigure introduced in 2015. His Teen Titans Go! variant was released in 2017 as part of 71255 Teen Titans Go! Team Pack. Beast Boy has slicked back, dark green hair. 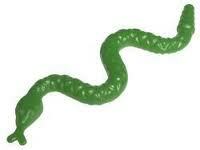 He has a pointed green ear, on each side of his hairpiece. Beast boy's head and arms are also bright green. Beast boy has black eyebrows, eyes and a black closed mouth. His eyes and visible pointed tooth are both white. The front of Beast Boy's head shows him smirking, while the other shows him scared with his eyebrows slightly raised. Beast boy's torso is purple, and represents his suit. The sides of his torso have a curved diagonal black line. Beast boy's muscular features are printed over the suit. The bottom of his torso has a rectangular silver belt, with a circular buckle in the center. The printing continues onto the back, except the belt does not have a circular buckle in the center. Beast Boy has black arms, green hands, and purple hips. His legs are dual moulded, the top is black and the bottom is purple, representing his boots. Beast Boy is a member of the Teen Titans who can change his shape into the form of any animal, though the animals will always remain green. He received these powers after being bitten by a radioactive monkey. LEGO Beast Boy appears on a variant cover for New Teen Titans #4. Comics Snake Teen Titans Go!